I stumbled across these advertising stamps on the internet recently. They are said to be from the era of 1900 to 1920. 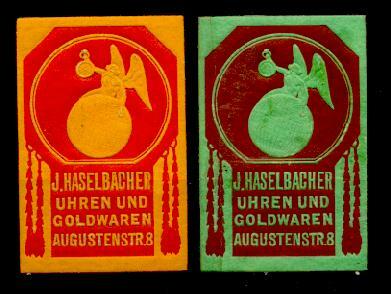 They advertise "Uhren und Goldwaren" (watches and goldware) and a shop at 8 Augustenstraße. I looked at a Munich street directory from 1899 that is available on Ancestry.com, but could not find any such business in the relevant advertising sections. In the section listing inhabitants by name, the page that would have contained Haselbachers was not readable. What are we to make of this. Certainly we accept that there probably are other Haselbachers and Hasselbachers in the world not related to us. It is also a fact that some Hasselbachers from Franconia moved south. To make matters even more interesting, in the archives of Neustadt I discovered registration papers of Hasselbachers who came from southern Bavaria in the 18th and 19th Centuries. I am still interpreting these papers. It remains possible that Hasselbachers who were a part of the Exodus from the Gresten Area in the early 1650s did not continue all the way to Franken in the north, but settled out along the way. The Hasselbachers of the Hallertau may be such a family.